There was quite a few new penny machines released this past week on Walt Disney World property and I promise to review those within the upcoming weeks. But I came across a few things online that were pressed penny related that I thought were really interesting and wanted to share. I’m sure you have seen the rubber pennybandz that you can buy at a lot of places where penny press machines are located. They are just plastic wrist bands you can wear that allow you to insert a pressed penny into it for display. I’m not sure how popular these are as I don’t think I’ve ever seen anyone wearing one. However I was browsing through Etsy the other night and came across something that seemed more jewelry-like. The Etsy store is called JustCharmsByPam and she has some charm bracelets that have a full set of pressed pennies on them. 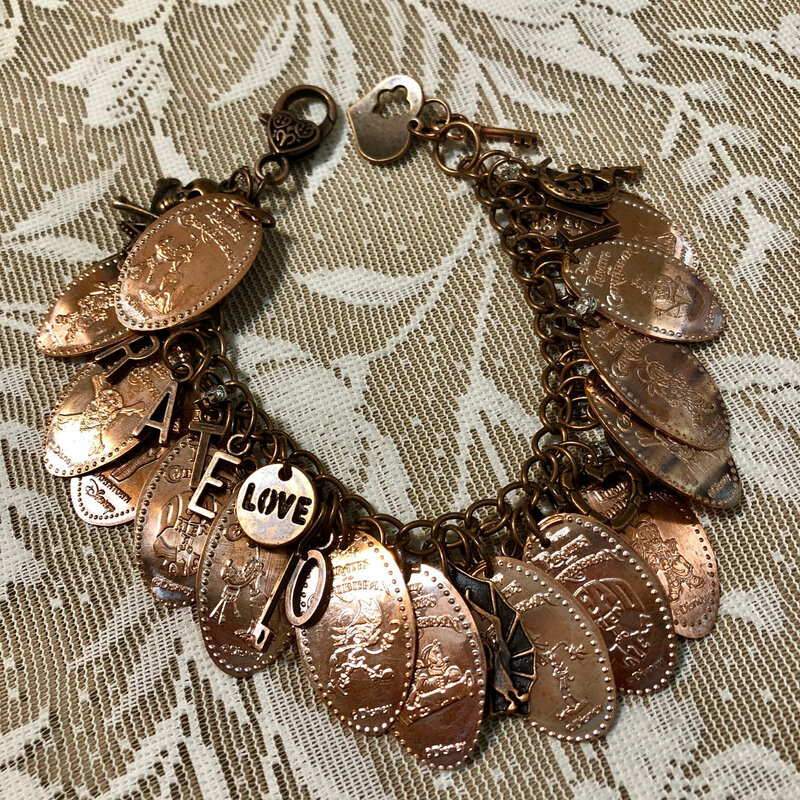 The pressed pennies have a hole punched in the top and threaded onto the bracelet with some other fun charms included. The above is a Nightmare before Christmas theme and she has a few other styles as well. Another version I found in her store had the Pirates of the Caribbean penny set. 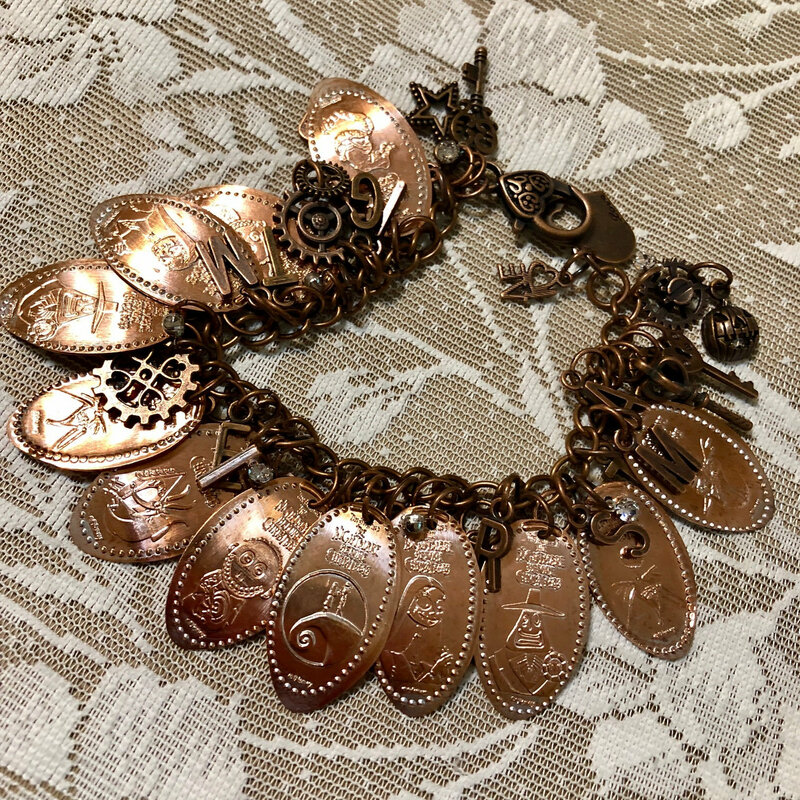 These bracelets do see pretty hefty but look to be a fun gift for any pressed penny enthusiast. Just a day or two ago I was up late cataloguing some new pennies when I decided to browse my Reddit account and see if there was any new Disney news. Of course there are always tons of rumors, and people posting about their vacations, but then something really beautiful caught my eye. There was not a lot listed in the post other than the above picture but I was stunned by this. I went into the comments to find more details and was able to get the artist’s website. Her name is Bry Marie and her website is brymariearts.com. She is an artists that paints these beautiful designs on pressed pennies, but also non-pressed penny (just a regular penny). 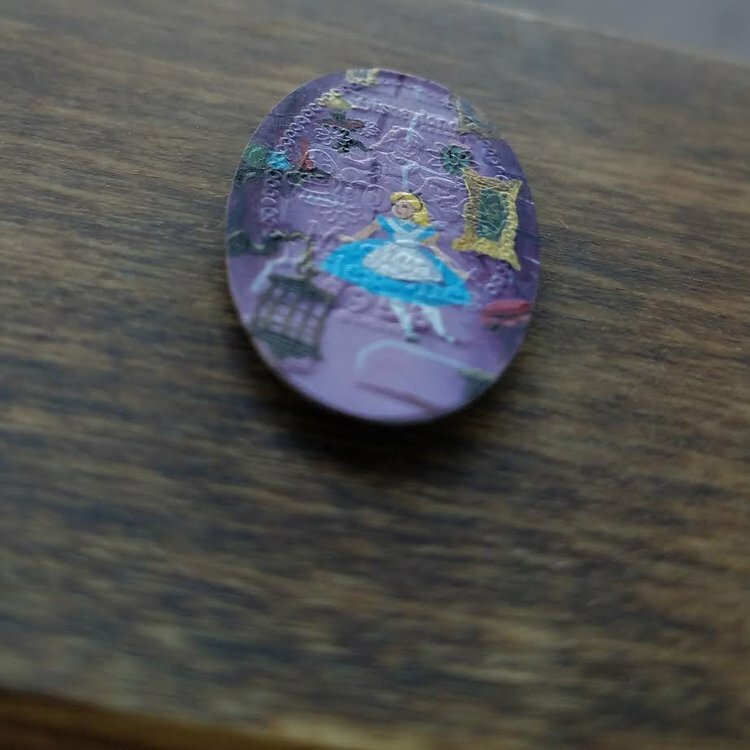 I found another one of Alice in Wonderland on a pressed penny and was almost speechless. The colors are really fantastic and being able to paint on such a small canvas is really intriguing. The above is the Alice coin just at a slightly different angle. You can see a little more of the pressed penny detail below the paint. 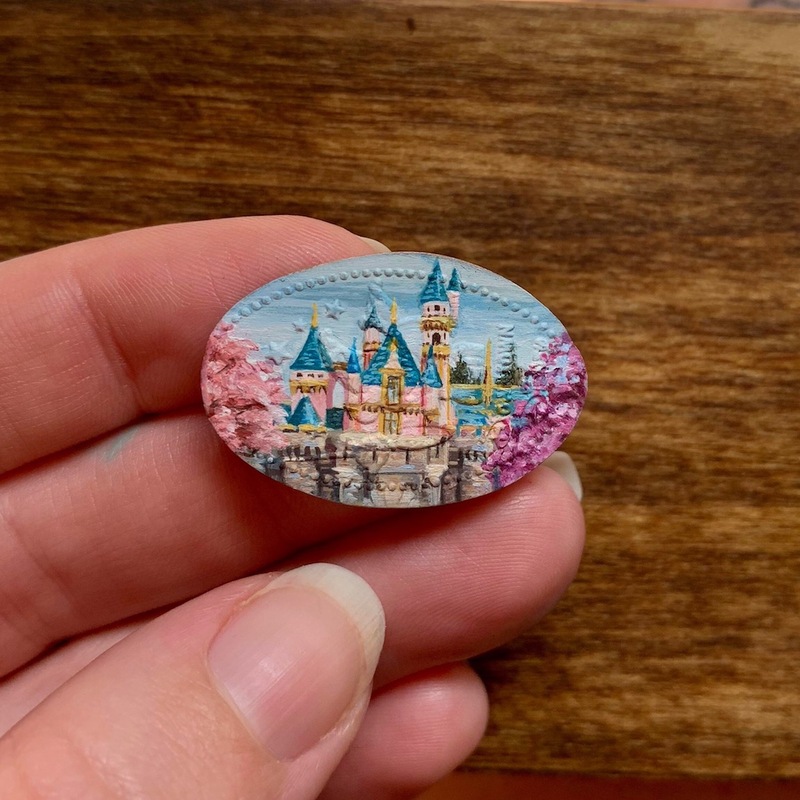 She does sell these through her website, the price can seem a little high but when you take into account the detail and work that must go into these I think they are worth every penny (ha). 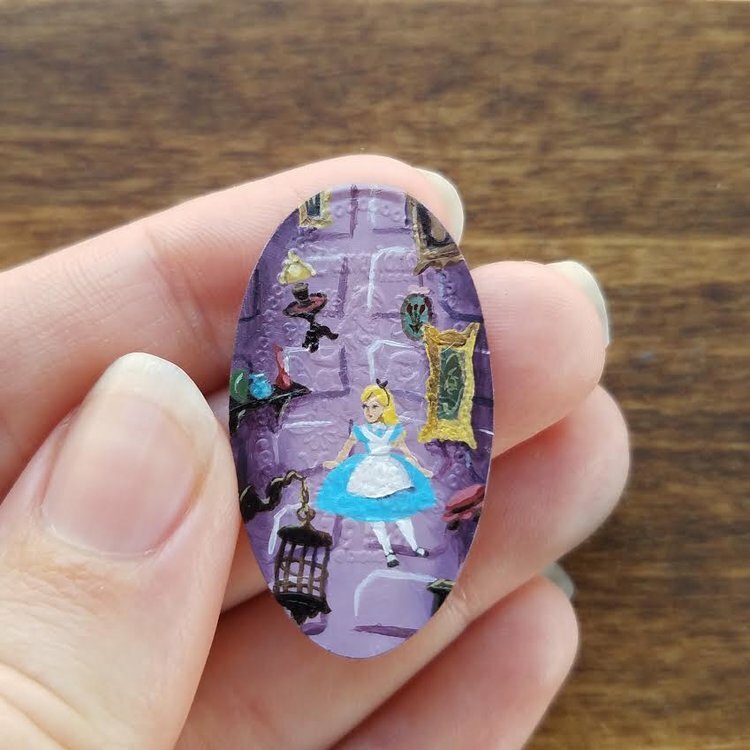 Unfortunately at this time her painted pressed pennies are out of stock, but I will definitely be keeping an eye on her site so I can pick some up when they are available again. I hope you enjoyed the hard work these artists put into their products. These are not paid advertisements. I came across them online and wanted to share them with all of you. Be sure to keep your eyes open when surfing online as you never know what you may come across that is pressed penny related. If you do find any other unique uses for pressed pennies please be sure to commend below so I can check them out.